Mastics and coatings can be divided into two basic types: vapor barriers and weather barriers. In addition to preventing physical abuse of the insulation, vapor-retarding mastics are designed to prevent water vapor from being introduced into cold insulation systems. Based on the performance requirements, these types of coatings can vary greatly in permeability. Weather barriers, on the other hand, are specifically designed to protect the insulation from weather damage. 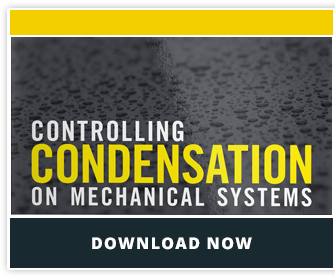 They tend to have a higher permeability than vapor barriers, so they are often over hot equipment so that water vapor is allowed to pass through the system while liquid water is repelled. Commonly used in cryogenic applications where the operating temperature reaches -40°F and in harsh chemical environments. This type of mastic has the lowest permeability of any other vapor retarders and is fire resistant, meeting Class A flame and smoke requirements. It is the highest performing vapor barrier material available for insulation systems. Commonly used on low temperature piping equipment that operates between -40°F and ambient temperature (applications include chilled water piping, air conditioning ducts, and brines). It’s also a great product to use for sealing seams, punctures, and facings. These types of mastics are chemical resistant, but have poor fire resistivity. They are often used to insulate buried, low service temperature piping. This is the most common mastic on the market for mechanical insulation. It provides weather protection and keeps out liquid water while allowing water vapor to pass through over hot equipment. These types of weather barriers are also UV-resistant. They’re commonly used for exterior ductwork and piping. Coatings on mechanical insulation generally need to be re-applied every 2-3 years. Mastics are a key component in the protection and functionality of insulation systems. Properly inspecting and maintaining coatings should be a regular part of any regular mechanical insulation maintenance plan.